Tom Welk is one of the most experienced and respected business litigators in South Dakota. During Tom’s forty plus years of practice, he has represented clients in complicated legal matters in all courts and before a variety of administrative agencies. Tom has also been engaged to conduct special investigations for governmental agencies as well as private clients and has defended numerous lawyers in claims of legal malpractice. 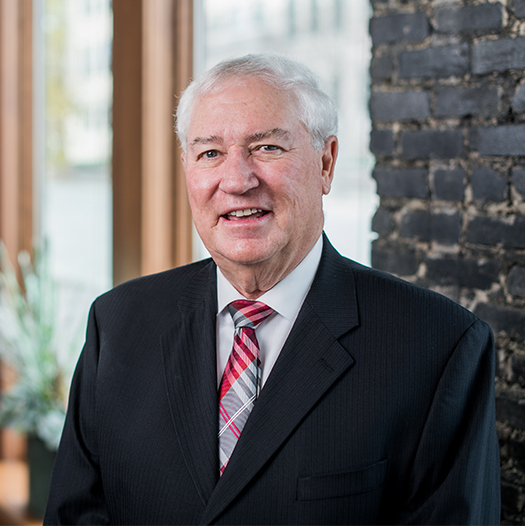 In addition to his active practice, Tom has generously and tirelessly given back to the profession through his active involvement with the State Bar of South Dakota, having held leadership positions on many committees and having served as President. Tom’s passion for improving the profession is demonstrated best by his leadership of the South Dakota Trial Academy and the South Dakota Practice Course offered at the University Of South Dakota School Of Law. Tom has over 40 years of trial and appellate experience in complex civil, criminal and administrative law litigation, representing individuals, small and global entities as well as governmental entities in the state and federal courts and before administrative agencies in South Dakota. He joined the firm in 1979 after working in the South Dakota Attorney General’s Office as the chief deputy in charge of litigation and was a former “white collar” crime prosecutor. • Adjunct Faculty at University of South Dakota Law School coordinating the South Dakota Practice Course, which provides, through lectures and drafting projects, experience in transactional law, civil and criminal litigation utilizing practicing attorneys as lecturers. • In 2013 to 2018, listed for the categories of administrative/regulatory law, and litigation involving antitrust, health care, commercial, energy, bet-the-company, banking and finance and regulatory enforcement, and labor and employment. Citibank, N.A. v. South Dakota Department of Revenue, 868 N.W.2d 381 (2015)(refund request of over $30 million for bank franchise taxes involving statute of limitations). Northwestern Energy Rate Case, SD PUC Docket EL14-106 (represented industrial intervenors) settlement approved by SD PUC by Order dated November 4, 2015. In re Otter Tail Power Co. ex rel. Big Stone II, 744 N.W.2d 594 (SD 2008). Lead South Dakota counsel for Big Stone II, a coal fired power plant project which exceeded $1.5 billion in construction costs, in obtaining various permits. Raven Industries, Inc. v. Clark Lee and Integra Plastics, Inc. 2010 SD 49, 783 N.W. 2d 844. Represented plaintiff employer in obtaining permanent injunction against departing employee and new employer. Herman Schumacher, Michael P. Callicrate, and Roger D. Koch vs. Tyson Fresh Meats, Inc., Cargill Meat Solutions Corporation d/b/a Excel Corporation, Swift Beef Company and National Beef Packing Company, L.L.C., 515 F.3d 867 (8th Cir. 2008). The case involved motions to dismiss, summary judgment, national class certification, a jury trial of a nationwide class and an appeal. Co-lead counsel for one of the defendants in a case involving alleged violations of the Packers and Stockyards Act. Dosch v. Avera Health, 731 N.W.2d 184 (SD 2007). Lead counsel for a hospital system in a state class action involving health care pricing issues. Mueller et al. v. Cedar Shore Resort, Inc., et al., 643 N.W.2d 56 (SD 2002). Represented eight officers and directors personally in a complex shareholder litigation matter. First American Bank & Trust, N.A. v. Farmers State Bank of Canton, et al., 756 N.W.2d 19 (SD 2008) Banking law litigation. Corner Pocket et al v. Video Lottery Technologies, Inc. et al., 123 F.3d 1007 (8th Cir. 1997), cert denied, 118 S. Ct. 1054 (1998). Appointed lead defense counsel by Chief Judge Richard Battey in a multimillion dollar and multiple party class action video lottery antitrust case. Chem Age Industries, Inc. v. Glover, 652 N.W.2d 756 (SD 2002). Schieffer v. Schieffer, 826 N.W. 2d 627, 2013 WL 266258, 2013 SD 11 (representation of husband in substantial net worth case involving prenuptial agreement, child support and relocation request of special needs child). Sanford v. Sanford, 694 N.W.2d 283 (SD 2005). Represented wife challenging prenuptial agreement involving one of the largest reported marital estates in the history of South Dakota. Involved in more than sixty (60) appeals to the South Dakota Supreme Court and Eighth and Ninth Circuit Courts of Appeal, and has argued over fifty (50) of these cases personally. Appointed receiver in family law matter — Mary Grace Raiche v. Fred Raiche, Minnehaha County Circuit Court Div. 13-565; Lisa Jane Nielsen v. Larry Lee Nielsen, Minnehaha County Circuit Court Div. 14-007. Special counsel engaged to conduct investigations for various public and private entities.